It felt like summer. 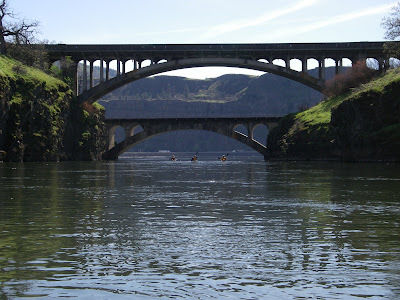 We were out on the Columbia and Klickitat Rivers today between Hood River and The Dalles. Sunny, about 80 degrees. It felt great. Neil and Tom organized this OOPS trip. The plan was to put in at Mayer State Park near Rowena Oregon (near The Dalles) and paddle across the Columbia to the Klickitat, up the Klickitat to the first few rapids and play there til the afternoon west wind built up in the Gorge. Then return to the Columbia and surf the wind waves back to Mayer Park. Well, by this morning it was pretty clear that the typical west wind was not going to materialize today. So Neil suggested we just spend the day playing in the moving water at the first few rapids on the Klickitat. Practicing peeling out of eddies, ferry gliding, etc. It was a beautiful day. Sunny, blue skies. No wind. We got up to the first fast water and all put our helmets on. Played for awhile in the first eddy and eddyline. Then worked to get up to the next eddy. Felt like work at the time anyway. We played on that eddyline a bit as well. There was a nice beach above the fast water and Neil worked pretty hard and took a fair while get to it. Looked like alot of work. Then Tom informed us that that was our intended lunch spot. And if we didn't get there we couldn't eat :) Great motivational speaker. Dave Dalbey went for it and got there pretty handily. Looked like the key was to have alot of speed crossing the eddline and cross the eddyline to ferry across rather than turn in any way downstream. I went for it. I had good speed crossing the eddyline and ferried to the other side fairly easily. Then got bogged down in the fast current near the rocks on the other side. Just couldn't make any progress. I was out of energy when Neil pointed out a little eddy I could rest in. Got it. Rested a minute then pulled hard for the last 20 or 30 yards to the beach. That was exercise. I was tired and ready for lunch! That beach was a great spot for lunch. After lunch most folks went up to the next set of rapids. I was enjoying the beach alot so napped a bit. Once they all came back we played for quite awhile in the current near our lunch beach. I hadn't been in current in a sea kayak since last summer so it was great to get the practice. And nice to do it on such a warm day so if one dumped ones boat the water felt great. Most folks were rolling periodically just to keep cool. Finally we headed back. We floated lazily down the last bit of the Klickitat down to the Columbia. The area is just beautiful this time of year. Still green and fresh with spring. Lots of flowers. Hawks and eagles and osprey, oh my. I saw a nice steelhead jump a couple times. Got back to the Columbia and as expected no wind. But it was a pleasant paddle upstream the short ways back to Mayer State Park. A good group of folks and a good day on the water.